People with a fixed mindset believe intelligence, ability and personality are unchanging, deep-seated traits. Whereas people with a growth mindset believe these traits can be developed over time with effort. It’s important to know that mindsets are conditioned. Up until you learn about these mindsets, you haven’t chosen one over the other -- it has been ingrained in you by the messages you receive from others. Dweck also shows through her research on student learning that in effect, these mindsets become self-fulfilling prophesies. In essence, people with the growth mindset really do… grow. Whether observing pre-med college students or fifth graders, Dweck observed that students with the fixed mindset showed greatest concern over looking smart, and were more likely to seek out easier tasks that affirmed their smarts and to give up when learning got hard -- hence preventing them from achieving at higher levels. In contrast, students who believed in their ability to get smarter with effort were more likely to take on, enjoy and master challenging tasks, even if they had experienced failure -- thereby enabling greater achievement. “Just by knowing about the two mindsets, [people] can start thinking and reacting in new ways… [Instead of] passing up a chance for learning, feeling labeled by a failure, or getting discouraged when something requires a lot of effort... they switch themselves into the growth mindset — making sure they take the challenge, learn from the failure, or continue their effort." For example, one of Dweck’s studies involved observing the math scores of a 7th grade class. Half of the students were taught about the growth mindset and the other half was taught about the states of memory. Remarkably, the control group’s grades decreased overall, whereas the growth-mindset group’s grades improved on the next test. The research shows that “with practice, neural networks grow new connections, strengthen existing ones, and build insulation that speeds transmission of impulses.” In other words, every time you learn you also improve your ability to learn. With the above in mind, there are a number of small but significant ways to act on this knowledge and improve opportunities to learn and grow for yourself, your employees, your kids, your spouse, and just about anyone else you share this earth with. When we refer to someone as smart, gifted, bright or perfect, we reinforce fixed mindset and diminish potential. When we talk about others as stupid, incompetent, or not the brightest crayon in the box, we reinforce fixed mindset and diminish potential. When we praise others for their scores, outputs, intelligence or talent, we reinforce fixed mindset and diminish potential. We do this by simply shifting our conversations to focus on growth-oriented abilities like effort, strategy, focus, perseverance, and improvement. Again, it’s within our control to shift from the fixed to growth mindset. If you’ve found yourself shying away from challenges, getting defensive when you receive feedback, or resenting the success of others, that’s okay -- but it’s time to exercise your growth muscles and recognize you have the power to lean in and benefit from a change in response. Growth mindset isn’t about making you do everything. It’s about helping you see that you can become significantly better at just about anything you put your whole self into. And you can’t put your whole self into everything, you don’t physically have time. Take a few moments to reflect on what your top priorities are today and what that you deeply care about it missing from that list. Slash the non-importants. And then start leaning in. 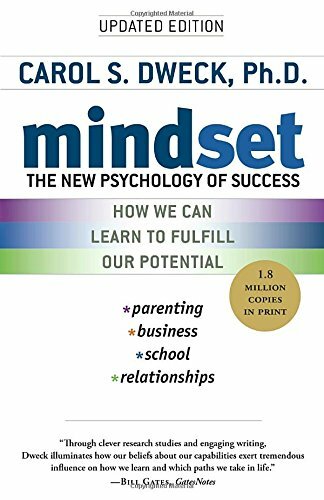 Dweck offers countless examples of the power and improved results of the growth mindset, from abilities like drawing and fitness to math, leadership and parenting. Like Wilma Rudolph, an Olympic runner who won three gold medals in the 1960 Rome Olympics. When Wilma was four, she almost died of pneumonia, scarlet fever, and polio -- and survived with a mostly paralyzed left leg. Despite doctors’ assumptions that she would never walk again, Wilma dedicated herself to physical therapy, kicked using her leg brace when she was 12, started walking normally and then trained to become a professional runner. When others challenge the growth mindset or pull you down the rabbit hole of “I’ll never be Picasso,” help shift the conversation to the reality that there are tremendous examples of effort leading to significant improvement and sometimes mastery -- show people it’s more productive and empowering to focus on the inspiring stuff that gets us moving. There’s much we can do on our own to change the way we lean into learning, challenges and development. But imagine the impact of this change taking place not just within us, but within those we work with, live with. Dweck’s research shows us that just knowing about the two mindsets initiates change from within. Share it, discuss it, prove it in your own actions and support it in others’. I think no matter our mindset or response to Dweck’s research, we can all see the tremendous potential value.